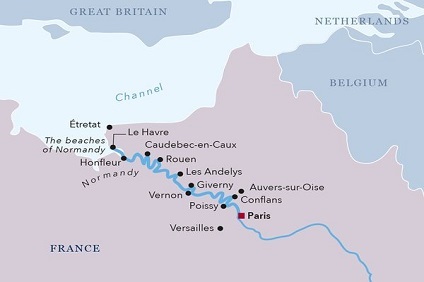 The AMADEUS Diamond is a new jewel on the French waterways. This cruise ship, which departs from Paris, travels exclusively along the Seine and allows guests to experience the charm of northern France in an unforgettable way. You will feel at home from the moment you board this stylish cruise ship, were stylish design meets the highest levels of comfort, inviting you to relax and enjoy the exceptional ambience on board. The ship offers countless options for your leisure time, from golf on the Sun Deck, to a fitness studio, to massage facilities, ensuring that every taste is catered for. Your accommodation on board is both elegant and comfortable. All 8 suites and the majority of the 68 cabins have French balconies, as well as modern bathrooms. Your culinary needs will be taken care of by the Panorama Restaurant, where you can dine in style, enjoying the luxurious ambience while admiring the fascinating passing river landscapes. Our friendly personnel will cater to your every wish with our famous Austrian hospitality. 7 Night Cruise sailing from Paris roundtrip aboard Amadeus Diamond. Immerse yourself in the warm colors and textures of one of our 12 suites. At 237 sq ft, you’ll have plenty of room to curl up in our Amadeus Signature Bed, recharge in a separate bathroom with shower and savor little luxuries for a blissfully indulgent stay. Connect with WiFi, enjoy a flat screen TV, a minibar and your own French balcony. Suites are located on the Mozart Deck. Richly appointed, our 62 staterooms are a comfortable 161 sq ft. Inside, visionary décor unveils sophisticated accents and amenities including the flat screen TV, WiFi, separate boudoir, cabinet, comfortable seating area, a safe, Amadeus Signature Bed and the panoramic view from your French balcony.